Can i return Flip Lands with Ramunap Excavator? 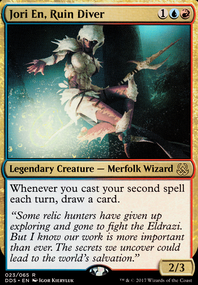 I'm not sure why no one is mentioning this but the best way to get draw in Red or White for that matter other than wheel cards, which you should run, are artifacts. There are many artifact cards that let you draw an extra card each turn, even the ones that make everyone draw a card each turn seem to give Red more advantage than other colors as your burn and copy spells are very strong. If you run out of cards before you opponent Ghirapur Orrery, would be a great card. Red is all about taking huge risks/gambles which pay off in the end. And you should run Gamble too by the way. If you run Wheel effects or effects that make everyone discard and draw, Geth's Grimoire, can give you huge advantage. If you are having trouble with lands I also recommend running more mana rocks. Cards that make Red spells cost 1 mana less to cast are very helpfull as well as anything that will double your mana. I also highly recommend Mizzix's Mastery, very powerful when combined with wheels and copied. You can recast the wheel cards on the first go and then use the cards you discarded from the wheel for the second go. I've cast over 20 spells in one turn doing this and managed to cast 3 cards that made me empty my hand end redraw that many cards or 7 cards using Mizzix's Mastery. I have two Red & White decks, one uses Wheel type cards heavily, the other uses Mana Rocks and Artifacts to make you or everyone draw cards. Barebareman, thank you for the kind words and support. I will update as soon as I showdown with the build. 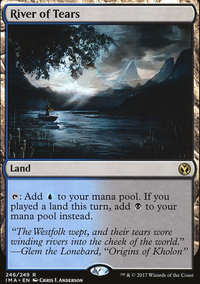 The rationale behind all the land is that yes, while the curve is very low, I want to be able to hold up my instants and stormtamer as much as possible in a controlling sort of way so that Im not falling behind. I have no real way other than Treasure Cove to draw my own cards so I have to make sure that the path to both resolution and attack for the thief is clear, making it a virtual 4-drop. The other reason for 26 lands is that when the engine is running I would like to be able to cast the cards Im taking hostage and exiling. Whiffs with these two can happen but when they hit they are guaranteed playables that I will need mana for. I think I can lose a land though, that's probably right. 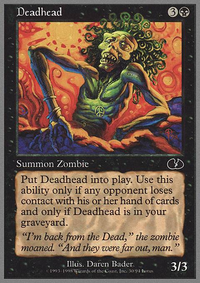 Doom whisperer is for sure an integral plan B, the deck would be weak sauce without its own win con I think. Yes. Because it never leaves the battlefield the ability continues to effect it. Treasure Cove will be a 5/5 artifact creature land. I use Tezzeret, Agent of Bolas' -1 on a Treasure Map Flip. Then I transform the treasure map. Does the Tezzeret ability continue to animate the Treasure Cove? Hey, I suggest 4x Treasure Map Flip gives you another turn two play that's an artifact. It makes treasures, self sac fuel for Master, mana ramp and fixing or draw with Treasure Cove. Consider to help the manabase only splashing red? 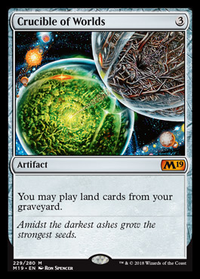 This means no cards only playing cards with a single in the casting cost such as Angrath, the Flame-Chained, Unlicensed Disintegration and Abrade. Consider Azor's Gateway Flip and Mastermind's Acquisition? Gateway is another two drop artifact it can be a drawing engine and Sanctum of the Sun can be an alternative win condition with Torment of Hailfire. 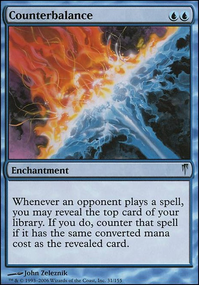 Mastermind is a tutor that can fetch Master from library or sideboard. You can hide a Master or Hailfire in the sideboard and tutor for it when you want it. This is especially nice with Hailfire as the card is very bad in multiples main deck because it takes a lot of mana to do anything and be worth one spot let alone four main deck spots. Adding more main deck artifacts makes Disintegration a very potent removal spell. Hey, looks good very nice budget deck. I suggest 4x Cartouche of Zeal, 3x Invigorated Rampage, 2-3x Kari Zev, Skyship Raider and a more cohesive sideboard. 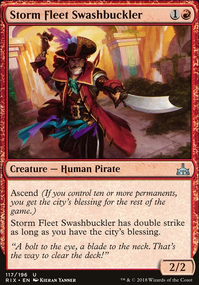 Two things Pirates lack what other red aggro has are a lot of powerful haste and being able to make a creature unable to block to get in more damage faster. Zeal does both of these things for one mana. As well as giving a +1/+1 pump to the enchanted Pirate. Both modes of Rampage make Dire Fleet Captain better giving two Pirates +2/0 and trample is good because you want to attack with Pirates to buff Captain. +4/0 and trample can make Dire Fleet Captain a game winning threat. Kari is one of the strongest Pirates, she's a two drop and menace is good with both Zeal and Rampage. Neckbreaker at four mana I think is a too much for what it does. If it gave Pirates +2/0 without attacking then it would be fine, but this delay makes it too slow. Cutting him will drop the mana curve which makes Captain better being able to consistently play more one and two drop Pirates. Rigger as a turn one Pirate play is pretty lackluster and all other one drops and two drops Pirates are better than it. Abrade for a Vehicle, Gearhulk, God-Pharaoh's Gift. Spray to exile embalm creatures Earthshaker Khenra, Sacred Cat, etc. Expertise to steal Gods, Glorybringer and untap it, a big annoying creature with counters thanks to Winding Constrictor as well as play a Pirate or Rampage for free from your hand, the card is very underrated. Kitesail Freebooter, Duress and Map is a good plan vs Control. Treasure Cove can be a source of card advantage using treasures as draw, but I don't think you need this in every matchup as it can be a slow interaction. No. Treasure Cove can only exist on the battlefield, after you have completed the conditions of Treasure Map Flip. 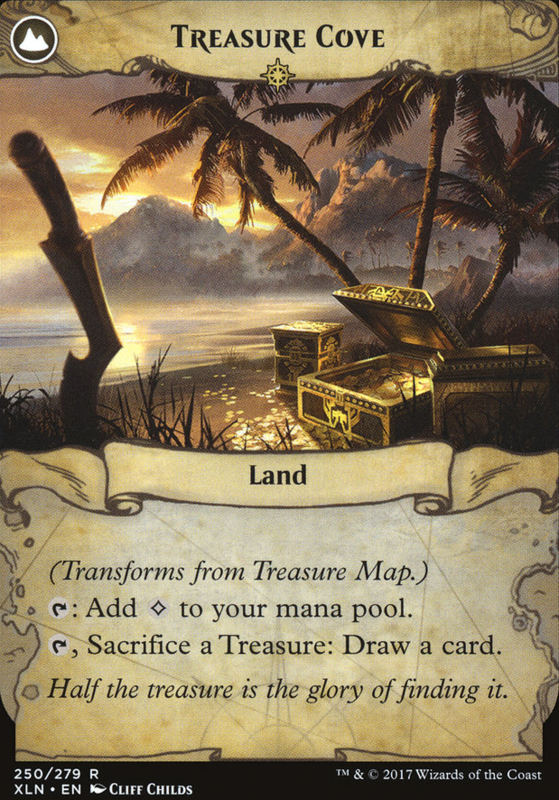 In all other zones the card has only the characteristics of Treasure Map Flip.